I am a milk snob and I have a love affair with all things dairy. Seriously. I had to give up dairy while breastfeeding my twins and I was miserable. I did it because my son was allergic and I love, but the moment he was weaned, I went right back to my cheese, milk and ice cream. But dairy in my food storage? Man that intimidated me a few years ago! All I could think was “GROSS!” Being the milk snob that I am, drinking gross milk sounded worse than not drinking it at all. I started seriously working on our food storage back in 2007, but I didn’t store milk. I just kinda left that in the “for another day” (when I get desperate) category in the back of my mind. Years after really starting to work on our food storage, I still hadn’t stocked up on milk. I just couldn’t imagine that any milk could possibly meet my standards. I wanted it to taste amazing and I wanted to be able to make ice cream and ricotta cheese and yogurt using it. I was just sure that was too high an order! Maybe you feel like I did about powdered milk. Does it scare you and intimate you? Maybe you have some stored and you use it occasionally in baking. Maybe you don’t use it at all. Maybe you don’t store it at all. Maybe you’ve never even thought about storing it. Well, today, I’d like to answer some common questions about powdered milk and clear up some misconceptions. If you are only going to store one food item, milk is a good choice. It provides hydration and a good amount of nutrients as well. You can sustain life for quite a while drinking just milk. Eventually, a friend with an actual, physical food storage store persuaded me to try a few different brands. Most were just as I expected: disgusting. Sorry, but it is true! There were some that tasted good, but they weren’t 100% milk, like Morning Moos, and I wanted real milk so that is was healthy and so that I could make things like ice cream, ricotta and yogurt. Luckily, there was one that met my standards. It was the instant milk from Thrive Life (not their powdered milk). It didn’t taste exactly like my fresh milk, but it was good. It was easy to mix. I didn’t have to add vanilla or sugar or have it sit in the fridge for a day or mix like a crazy woman to get it to dissolve (like many other milks I tried). I used it to make ice cream and ricotta (still need to try yogurt) and it WORKED! Yay! Now, I love having dry milk to mix up at a moments notice. When we go on vacation, I put a gallon of water in the fridge. When we get back I don’t have to run to the store. I just add some powder and we have instant COLD milk! I don’t ever run to the store for milk. I can tell the difference, but my kids and husband cannot. I started to wonder what made this milk so different. I mean, it is just 100% milk after all, just like many other companies products. Why did it taste so much better? I’ve found the answer and want to share it with you in the post. The difference is in the process used to turn milk into a powder. How is Dry Milk Made? Milk can be turned to powder by spray drying, drum drying or freeze drying. Spray drying is preferred as it produces much more even particles than the other two options which allows it to be far more soluble. In addition, the heat treatment with spray drying is not as intense as with drum drying so the taste is not as altered. But drum drying is more expensive so it isn’t as common. Most dry milk has been drum dried. What Milk Should I Store? There are a LOT of different powdered milk options out there! Many food storage companies offer powdered milk, but it is often called lots of different things. You will find Instant Milk, Powdered Milk, Milk Powder, Non-fat Dry Milk, Non-Instant Dry Milk, Powdered Milk Alternative etc. Unfortunately, there is no consistency between the names. One company’s milk powder might be a completely different product from another company’s milk powder which might be the same product as a 3rd company’s non-fat dry milk. it is not 100% milk! This means it isn’t as healthy and it won’t work right in your baking because of the extra shortening and / or lack of the milk protein in it. You won’t be able to make cheese or yogurt with it. I highly suggest that you make sure whatever milk you choose is 100% milk! What is the difference between instant milk and powdered milk? Once you’ve found a real milk option, you will need to decide between instant and powdered milk. Many companies offer both and both options can be real milk or a milk alternative. The difference is how easy they are to use. 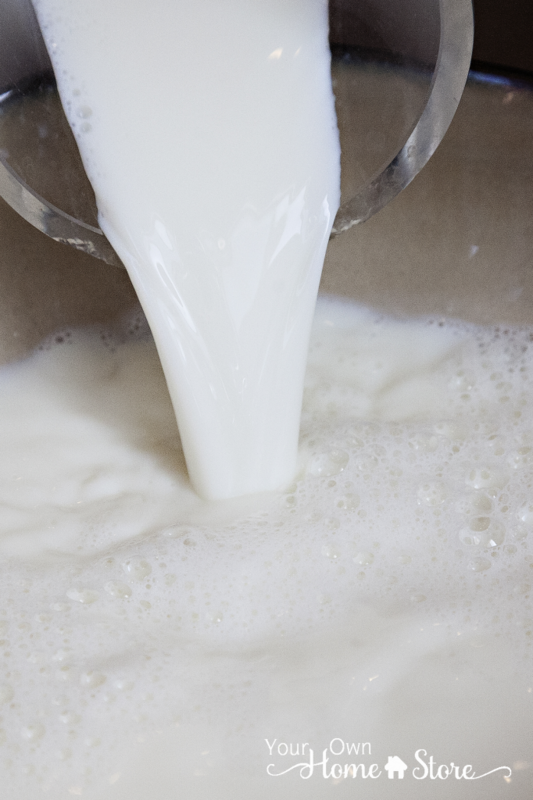 Instant milk is typically spray dried since milk dried in this manner is more soluble. In addition it is usually puffed with air as well which makes it even easier to mix with water. It typically tastes better than non-instant powdered milk, but is a less cost effective option. It often costs more per can AND you need more powder per cup of water. Non-instant powdered milk is typically drum dried and is not puffed with air which makes it difficult to mix with water. It requires more stirring and chilling before it can be served as milk and typically doesn’t taste as good as instant milk. However, non-instant milk is a more cost effective option because the lack of air in the particles means you can fit more in each can. It typically costs less per can AND you need less powder per cup of water. Many people think that instant milk doesn’t work as well as regular powdered milk in baking, but this is not true. As long as it is 100% milk, and not a milk alternative, it works just great. Plus, it has the added benefit of dissolving in cold water. Most non-instant powdered milks must be dissolved in warm or hot water (which again, affect the taste!). But Thrive also offers a 2nd type of milk that they call powdered milk. It is drum dried and doesn’t taste very good (hey, I’m honest!). But it is 100% milk, so it works well in baking and is less expensive. So, I store both types: the instant milk for drinking and the powdered milk for baking. Can Powdered Milk Taste Good? Yes! Some of the milk alternatives taste good (b/c of the addition of whey, oils and corn syrup), but they aren’t as healthy for you and won’t work as well for cheese or in baking or yogurts. 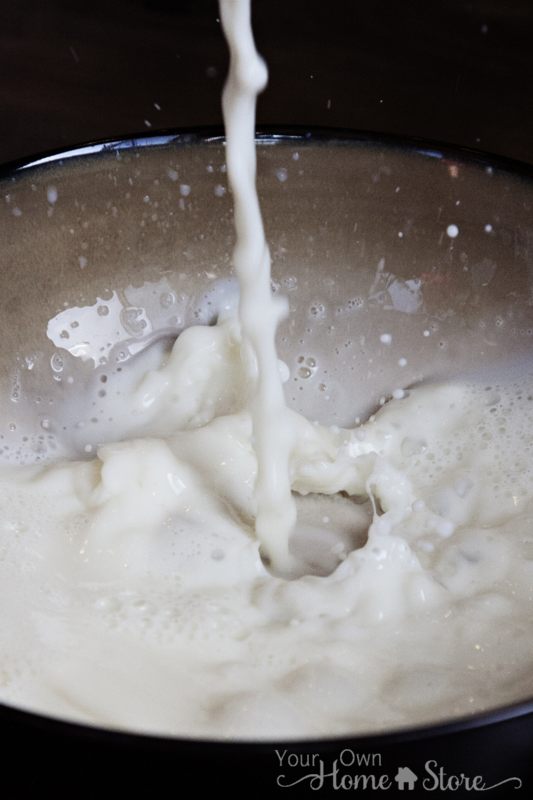 Milk that is made through drum drying has been through an intense heating process which changes the taste quite a bit. Dried milks that are spray dried taste much better since there is less intense heat applied. I’ve tried quite a few different brands of powdered milk and I like the Thrive instant milk the best. We drink it often in our house. If you already have another brand of milk stored that was drum dried or simply doesn’t taste as good, you can use it in baking where the taste won’t be as noticeable. If you actually need to drink it, mix a bit of sugar and vanilla in with the milk and make certain it is cold! Why is most powdered milk fat free? Fat doesn’t store very long. This is the reason most powdered milks are non-fat: they have a much longer shelf life that way! But if you like 1% or 2% there is an easy fix! Just add a bit more powder to your milk to thicken it up. You will get the taste of the milk you like without the fat! If you really must have whole milk, I’ve hear good things about Nido. But it is not 100% milk and it has a much shorter shelf life, so make sure you like it before you stock up on it. Try it in your baking and then make certain you rotate it. 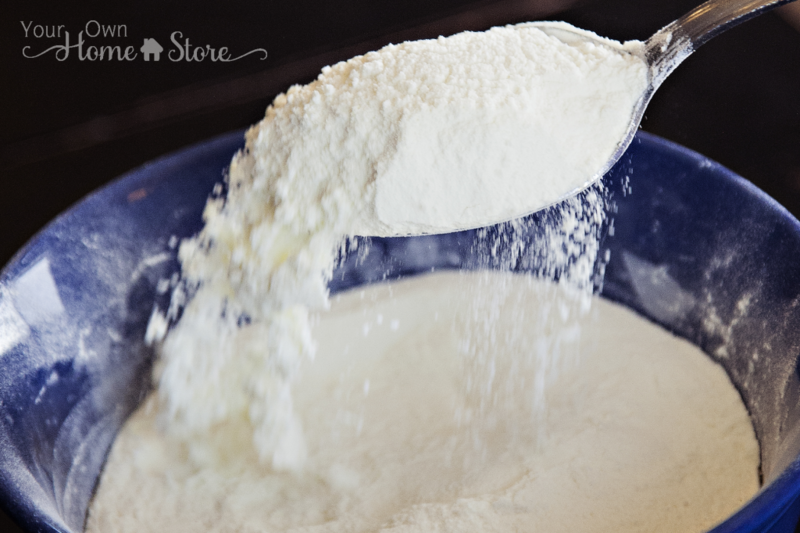 How should I store powdered milk? Make sure any powdered milk you buy is packaged for long term storage with an oxygen absorber. Like most food, powdered milk will do best when stored in a cool dark place. The 20-25 year shelf life on most milks assumes a relatively stable temperature around 70 degrees Fahrenheit. For every 10 degrees above that, you cut your shelf life in half. How can I use powdered milk? Use your milk in baking! If a recipe calls for milk, just add the appropriate amount of powder to the dry ingredients and the water to the wet ingredients. No need to mix it up first! And if a recipe calls for sweetened condensed milk, evaporated milk or buttermilk, you can use your milk for that too! Sweetened Condensed Milk: 1/2 cup hot water, 1 c. of powdered milk powder (or about 1.5 cups if you are using instant milk), 1 c. of sugar, 1 T. of butter. Blend very well. Buttermilk: Mix up one cup of milk according to the directions on the can. Add 1 T. lemon juice or vinegar to the milk. Stir it in and wait for 5 minutes. 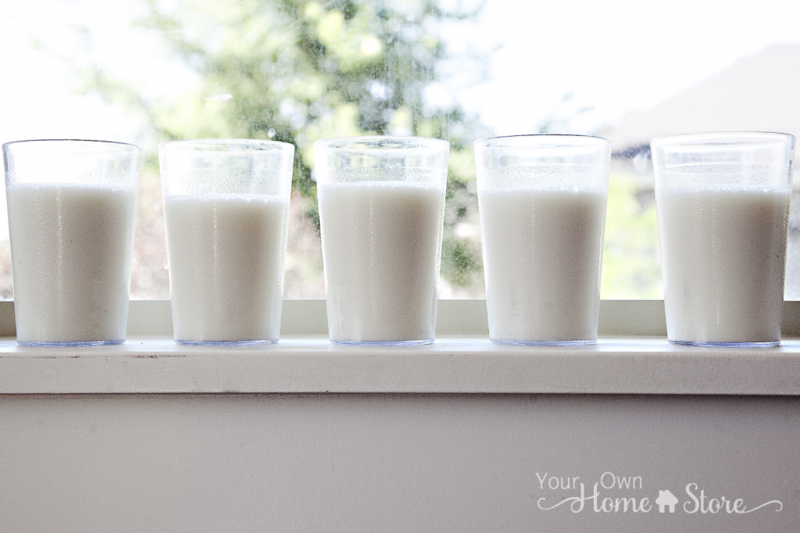 Evaporated Milk: 1 1/2 c. water with 1/2 c. + 1 T. powdered milk powder (or 3/4 cup if using instant milk). Whisk together thoroughly. 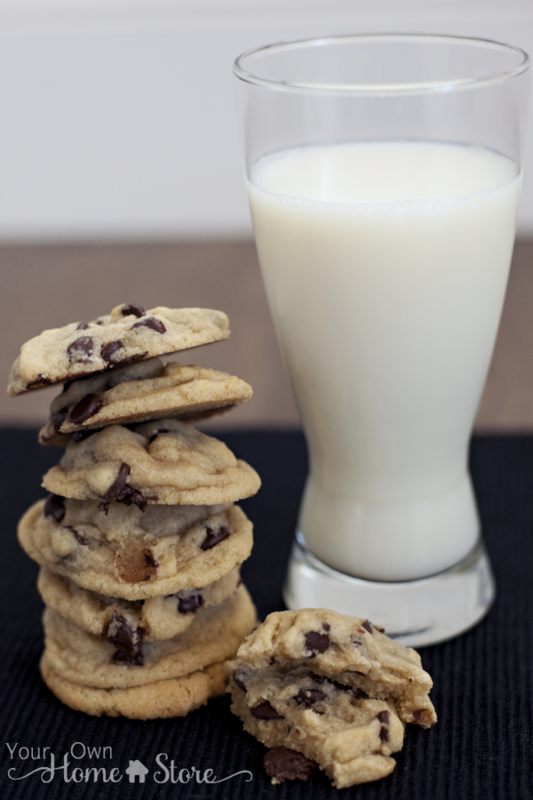 Or, simply enjoy a glass of milk with your favorite cookies! Great information. Where do I order in RSA? Thanks Misty. Good information. Would they have this at LDS storage stores or just at Thive? I was wondering about the powered milk they have in the big box stores. The LDS Storage center has powdered milk – not instant. I use it for all my baking, but not for drinking. Excellent post on milk! Probably the best one I’ve read. We like it when you’re 100% honest, so keep it up. Thanks Patti! I like being honest too! thanks for pointing out the difference from powdered to instant milk,,I can never remember which is which.I have had the thrive,need to get more.I use it too in mashed potatoes,keep some of the water and add the instant milk. This was really great information. Thank you. You are very welcome Rebecca! Thanks, for the great information on powered milk. We don’t have alot of money for groceries. We had a relative gave us a few bags of it. I thought I’ll never use this. Wrong once I found out to use it in cooking and baking it has saved us money. Haven’t drank any of it yet but we also had some of the liquid ones and my sons used it on their cereal they didn’t complain. How many gallons can a #10 can of instant milk make? It just said there were 57 servings in a can and the mix ratio was 3 Tbls of inst. milk for 1 cup or 3 cups inst. milk to make 1 gallon.. It is confusing! 3 Tbl (so 1 cup) is considered one serving. So, you’d get 57 cups from one can or around 3 1/2 gallons. But I mix mine differently than what is on the can. That “recipe” tastes more like 2% milk to me and we drink non-fat, so I mix 2 1/4 cups per gallon and get around 4 1/2 gallons per can. I hope that helps! You mentioned freeze dried milk, but din’t tell us anything about it. I understand it is the tastiest, most complete nutritionally and longest lasting. I have not been able to find a company that actually freeze dries their milk Grant. It has been a year or more since I”ve looked though. From my research (done a few years ago when I wrote this article), most articles and studies I read said that spray drying was best for milk as far as taste goes b/c it makes a much more soluable product. I use a lot of freeze dried produce and meat, but from what I’ve read, spray drying is best for milk. If you have more updated information, I would love a link! You have convinced me, I too do not like the taste of the powdered milk i have . I need the info to order from thrive so that you get the recognition . You can pick up just a small (called “pantry” size) can of it here Donna! It’s important to understand that Thrive instant milk is not the same as the instant milk you can buy in the grocery store. Grocery store instant milk has much larger particles and has twice the volume per weight as non-instant powdered milk. and many crystallized instant powdered milks. Plus it is much tastier! My daughter and I have Celiac Disease. Is the milk 100% dairy? No gluten or wheat products? Also, can you tell me what Thrive products are gluten free? I am interested in the products but I am concerned we will not be able to use them. This post just made me really glad I bought 2 buckets back when it was on sale! Thanks for all the helpful info and recipes. Looking forward to the continuing of this series.